For the fourth time we prepare Christmas offer of our FairTrade shop – Gifts with story will please your family, employees or clients. We offer gift packages in different values and designs. From smaller variants in a cellophane bag to bigger packages in paper boxes. Standard package contains fair trade coffee and tea from Kenya and a soapstone statuette that was made in manufacture on the Island of Hope. Antony Mbugua Gitau is in the 7th grade and is 12 years old. His mother died when he was still small, he now lives with his father and grandmother. Without the support of adoptive mother Sandra Antony would not be able to go to school. He likes football and skating. What does he want to be and what makes him happy? And how is the program perceived by his family? This is what Antony, grandma Rachel and father James will tell you in the video… The Adoption of African Children Program – The Long Distance Help Project has been in operation since 2002 and helped over 4,000 children with education. Join us and change one human fate! The end of 2018 is marked by beneficiary, promotional and sales events. We are looking for new possibilities of cooperation, thank you in advance for your help! Like every year during autumn and winter, we are looking for new opportunities where we would be able to present our projects and offer the FairTrade products. We have experience with promotional, presentation and sales events, festivals and sales in shops or school fairs. 10 years of health insurance! This is a true story about adoption number 52223, Beatrice Mueni who is in standard two. Her adoptive parents supported her family in 2015 when her mother wrote a letter of what they were going through as a family. Thanks to the adoptive parent who gave some extra payment and I supervised the family in doing shopping. KAWAK are recycled bags made of jute coffee sacks. We process “waste” from Czech coffee-roasting plants, which is also beautiful and solid material perfect for carrying things. From each bag we sell, we contribute 100,- Kč to the project Island of Hope of Center Narovinu. Fish cages are on the place on the Victoria Lake. Thank you for supporting to the two-years SlovakAid project and other partners and collaborators that we will be gradually introduced you… Gages are 2 x 2 x 2 m, the anchor blocks are made of concrete, one weighs 500 kg. Place for the placement requires at least 9 m of depth. Dear adoptive parents, friends and fans of Centrum Narovinu. Thank you for all your support which we appreciate very much. We wish you a merry Christmas and a great new year filled with joy, love and happiness. Looking forward to another year spent together. Donate 180,- Kč in support of the Island of Hope clinic and as a thank you gift we will send you the 2018 Island of Hope calendar.☺The donation will be used to buy medicine and medical material, and to cover salaries of the hospital staff. The clinic has over 15000 registered patients, an ambulance license and also offers hospitalization. It is open 24/7 and it is offers an indispensable refuge for the local people. 15 years of AdopceAfrika.cz – Pay it forward, it makes sense! Get to know Maureen and her story. Thanks to the support, she is studying at university now and wants to be a journalist. Become a part of someone's story too! Supporting education makes sense! Thanks a lot to all of you who contributed to a new kitchen and a dining hall for 500 children. The fund-raising campaign ran from February 2016 to October 2017. The building is in service now, its open terrace working as a leisure-time and evening-activities centre of the whole Island of Hope. Extra payments are extraordinary one-time payments that adoptive parents can send to their children in addition to the regular payments for school fees. The extra payments can serve various purposes: they can be used to help the family in a difficult life situation (for example by buying food), to buy a bicycle or a laptop (which will help the students in their studies), to support a business idea (of students that have already finished their education), etc. We have decided to limit the number of extra payments due to organizational and personal reasons to one payment per trimester and we always try to make sure the payment is really needed. GIVT – click and help! Thank you for your online help! The amount of Kč 1 143,- has been spent on food for children from the Island of Hope community centre. Although the project includes breeding fish, farming chickens, and growing fruit and vegetables, it isn't still easy to provide 500 boarders with food every day. Thanks for your help and support! 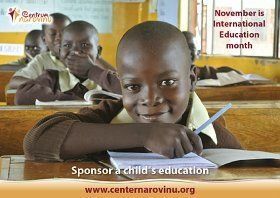 The Narovinu Center started in 2014 a campaign ‘Pay it forward’ to support its development projects in Kenya. In this campaign, it is possible to contribute with one-time donation to specific items for Adoption of African children – long distance support project or community centre of ‘Island of Hope’ on Rusinga Island. Rusinga Island is one of the biggest islands on Lake Victoria with population about 30,000 inhabitants, of whom about half are children under 15 years. This very poor area has one of the highest mortality rates in the county, and therefore a large numbers of orphans. The island is strongly affected by the presence of malaria, HIV/AIDS, typhoid fever, TB, parasitic and other diseases. Fishing is the main economic activity in this region..